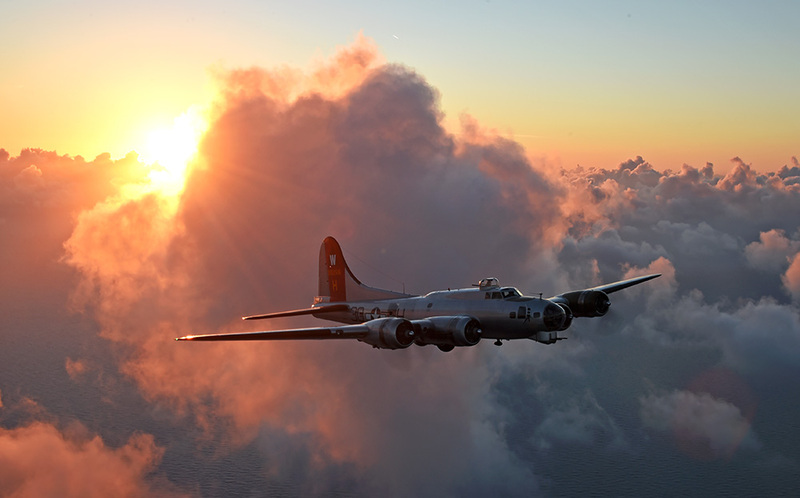 EAA’s own laboriously restored WWII Flying Fortress Bomber, “The Aluminum Overcast,” captured in Flight. The Experimental Aircraft Association (EAA) of Oshkosh, WI sends their restored Boeing B-17G Flying Fortress Bomber around the U.S. to both inspire Americans to explore the great adventure of flying, but also to help them more fully appreciate their own unique history, particularly the years of WWII, during which we fought for our very survival as a nation. The Flying Fortress is almost surprisingly not a large airplane, but its reputation helped make it seem much larger than it really was (is!). It is the American bomber that played a huge role in helping to turn the tide against the Axis powers in Europe, by “softening up” the Germans (and the Italians) for the D Day invasion. Its upgraded and much larger Boeing version, the B29 Super Fortress, is the aircraft which delivered the atomic bombs over Hiroshima and Nagasaki Japan, finally ending the war in the Pacific. The EAA Chapters 555 of Las Cruces, and 1570, of Santa Teresa NM, were both honored to be able to work with the International EAA in helping introduce this historic Air Corps aircraft to the people of their respective and neighboring communities during January 2017. While the local weather did anything but cooperate at both locations, the display and exhibition project was still quite successful, with many hundreds of visitors attending, and some even going aloft in the bomber at both events. The FASF has a number of active members in both the EAA Chapters, and some both volunteered their time to help this B-17 exhibition and/or made sure to attend the events at both locations. Here is a quickly spliced together video recording of the final day of the display, held at the Santa Teresa, NM Jet Port. It is 24 minutes long, which is admittedly too long, but your webmaster is only beginning to get the gist of video editing, so expect a much briefer version of this longer video shortly. A number of active FASF members either attended or volunteered to help make the exhibition and flight a success: Tomas Peralta, who owns and manages the RED ARROW FLIGHT ACADEMY at Santa Teresa, directed the entire B-17 exposition, and two of his instructor pilots, Jim Foster and Debbie Rothschild, were very active in making the program a success. RED ARROW is a proud business sponsor of the FASF. Also pitching in were FASF Business members Bob Dockendorf and George Guerra, who keep the great War Eagles Air Museum alive and well. When the shorter video is posted here soon, we may also have some video footage of the actual flying experiences and views taken by some of our members, who shot their own in flight video. Also actively volunteering in this “Aluminum Overcast” operation at the Jet Port were other members of the FASF, as well: Col. John Orton (long time FASF Board Member and Advisor) was a key volunteer, and FASF activist member, John Read (Chief Park Ranger at the Columbus, NM Pancho Villa State Park), his wife, Ellie, and John’s Mother, also made the journey to take part in the Flying Fortress adventure. Make sure and visit the companion post, THE SWAMP GHOST, which is about a recovered B-17, one shot down over New Guinea in the South Pacific during WWII, that was recently returned to the U.S. and is now undergoing its own restoration. This entry was posted in AVIATION NEWS on January 24, 2017 by FASFRIC.